The Social Security Administration offers Social Security benefits in two important situations. First, it provides you with benefits if you’re injured and unable to work. These benefits help supply you with income if you can’t go to your job. Secondly, Social Security benefits are available after you retire, so that you will have money in your golden years when you can no longer work. Social Security benefits are paid for by your taxes. Whenever you get a paycheck, you’ll notice a deduction made for Social Security benefits. In addition, the income taxes you pay help pay for benefits for those who need help but haven’t contributed enough. If you’re disabled, you can apply for benefits. If you’re denied benefits the first time, you have the right to appeal. You’ll generally get disability benefits if your condition meets the Blue Book requirements established by the Social Security Administration. For example, if you have certain types of cancer, simply proving you have that type of cancer is usually enough to get you benefits. If your condition isn’t listed in the Blue Book listings, you’ll need to submit medical evidence from a doctor to show your condition prevents you from working. You’ll be able to continue benefits as long as you’re disabled. When you retire, you can secure Social Security benefits, as well. If you’re on disability at the time you retire, your disability benefits will generally automatically be converted into retirement benefits. How much money you get for Social Security will depend on several factors. One of the biggest factors is your contribution level. If you’re making a considerable income and have been contributing automatically through withdrawals for your entire working life, you’ll generally be able to get larger Social Security benefits. However, there is a cap on benefits. In 2016, for example, there was a maximum amount of $2,639 for those who retired at age 65. If you’re applying for disability benefits, your ability to work, and any other source of income you have, will determine your disability benefits. If you’re applying for Social Security for retirement, the age at which you retire, your marital status and the length of your work life will all determine how much you secure. The longer you work and the older you are when you retire, the more you will generally get in benefits. 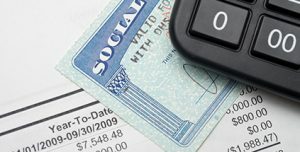 It can be difficult to know how much you will get for Social Security because the answer depends on several variables. Money Help Center has calculators to help you tally up your benefits so you can estimate and accurately plan. Our calculators are bias-free and are free to use at any time. How close are you to your retirement savings goal?